This is our best and most popular mill package. The HeavyWeight Mill is our "Cadillac" mill, featuring our latest options along with the time-tested, proven features that our customers depend on. This mill has been continually improved for over 40 years, and we continue to innovate and improve its design to this day. Over 500 customers depend on this mill package in their operations. We build each mill with pride and a personal touch. Despite its simplicity, over 40 years worth of engineering, blood, sweat, and tears is manufactured into each mill. 2 Knee Magnum LT Carriage for cutting ties, pallet lumber, and custom products up to 12' in length. Very fast. 3 Knee Magnum LT Carriage for cutting grade, ties, sending cants to resaw, or specialty products up to 16-18' in length. Very versatile. 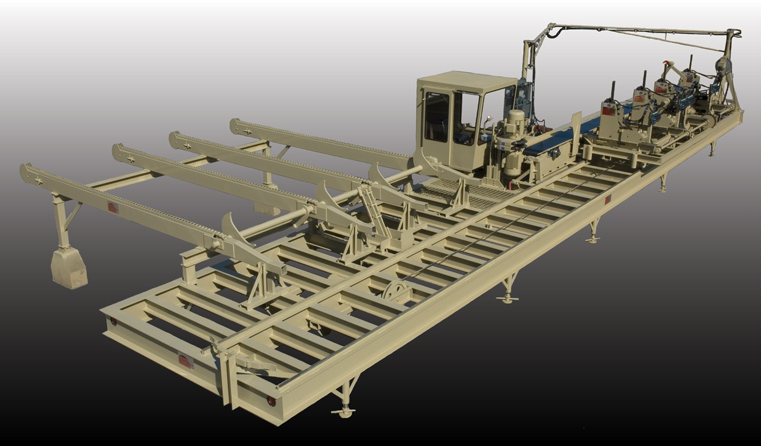 4 Knee Magnum LT Carriage for cutting mat material, long timbers, or other specialty products up to 30' in length. Dependable mechanical setworks. Used on hundreds of Hurdle mills. 4-sets. Replaces cambox. 6 sets - adjustable from inside sawyer's cab. The simplest electronic setworks anywhere. Offers 8 sets, 8 cants, and 8 stacks for 4 species. Simple and easy to use.